When the U.S. Tax Law has no Statute of Limitations against the IRS; i.e., for the U.S. citizen and LPR residing outside the U.S. There are basically three ways a U.S. citizen living outside the U.S. will have no protection of a statute of limitations vis–à–vis the IRS. The statute of limitations is the time frame in which the government has to conduct an audit against a U.S. taxpayer. 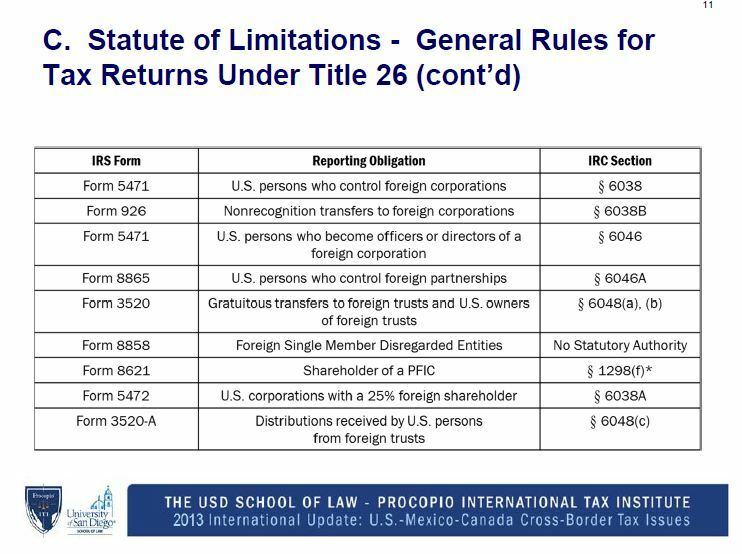 This is important, since once that time frame lapses (i.e., the statute of limitations period is over) the IRS cannot commence tax audits or assess taxes or tax penalties against the USC or LPR living overseas. 1. The USC or LPR does not file a U.S. income tax return. IRC Section 6501(c)(3). For an excellent overview of the statute of limitations periods, see the presentation – “Starting the Race Against the Tax Authority in the International Tax World – Statute of Limitations & Lack of Filings” by John C. McDougal, Special Trial Attorney – IRS, Jon P. Schimmer and Eric D. Swenson of Procopio. One of the basic points to takeaway from the law, is that a USC or LPR is almost always better off by filing tax returns (complete and accurate), even when no tax is owing. This will help assure him or her of a fixed time frame during which the U.S. federal government can conduct tax audits and other related tax investigations. When does the Statute of Limitations Run Against the U.S. Government Regarding FBAR Filings?